Ferdinand Magellan is famous for planning the voyage that first went around the world. He conquered many obstacles on his trip. What many people don't know is that he died before the voyage was done. 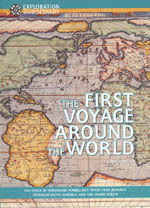 Follow Ferdinand Magellan as he follows his dream to sail around the world. This illustrated article gives you the before, during, and after of Magellan's voyage. The result was a new understanding of the world. This is one of the very few primary sources to be found on the Internet. It is the story of Magellan's voyage as seen through the eyes of a Genoese pilot who accompanied Magellan on the voyage around the world. The publisher of this website has written a book about Magellan.